LWPS XI Main Event Satellites on Pokerstars Tonight! Congrats to eRaiser88 for qualifying the LWPS XI Main Event Seat. Congrats to MaxTilt for qualifying the LWPS XI Main Event Seat. 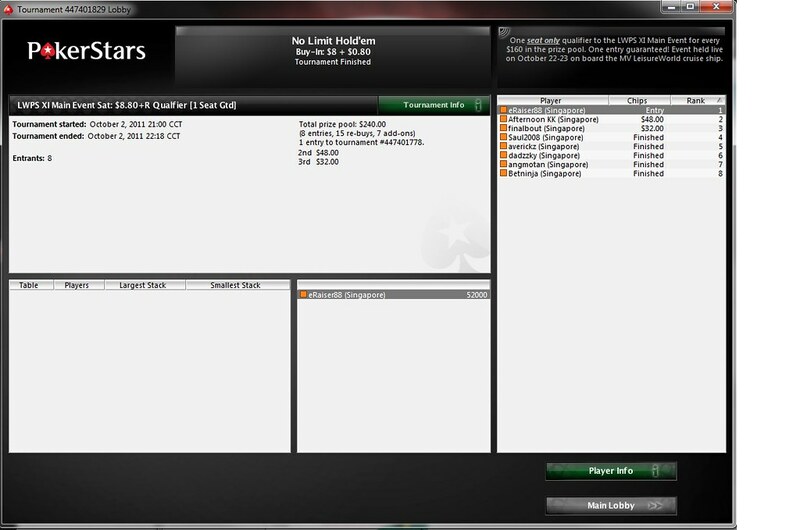 Congrats to eRaiser88 for qualifying another LWPS XI Main Event Seat. daniel chua is god lol too good!! he is just a lucky fish... no skill one, totally luckbox!!!! Congrats to kaki dadzzky and pantonecode for qualifying the LWPS XI Main Event seats. LWPS XI Main Event and Finale Bounty Shootout Satellites on Pokerstars Tonight!